Laowai Jie (老外街), translated as Foreigner Street, is pedestrian Lane 3338 off Hongmei Lu in Gubei District. During the days of communism, this area is where Chairman Mao’s 101 trains ended their cross-nation journeys, and today you’ll see reminders of this history with statues and plaques. Since then, Laowai Jie has transformed greatly. As the name suggests, the street is lined with American, Mexican, Italian, Greek and Indian restaurants. 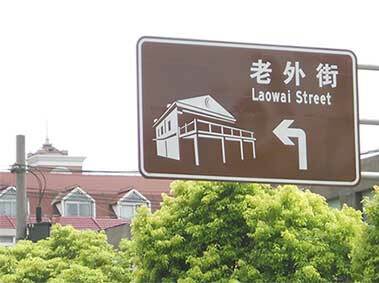 Laowai Jie is as international as the city of Shanghai itself! Burgers, fries, milk shakes…you already know where we’re going with this description. This American diner serves up phenomenal burgers under a cool atmosphere with good music and a friendly staff. Fat Cow makes the journey all the way out to Gubei well worth it, and that’s why it is, for me, the best place to grab a bite on all of Laowai Jie. Two thumbs up. Bastiaan Bakery & Konditorei is a quaint German bakery with above average sandwiches, soups, homemade bread, salads and especially, sweets! True, their entrees are indeed good, but their cakes and desserts are what put Bastiaan on the map. Their pastries, cheesecakes, and tartlets are my top three favorite; I always bring some home to put in the fridge. Also keep in mind that breads and cakes are half off after 9pm. Opa! Finally a decent Greek restaurant in Shanghai. Do not eat here without ordering hummus, pita bread, fried eggplant and moussaka – made from the owner’s own family recipe! The Taverna has a wonderful terrace that’s perfect for bright-lit blue skies and the service is always wonderful as the owner periodically strolls around the restaurant to speak with guests. Unfortunately, the only thing that it lacks in authenticity is the conspicuously absent broken plates on the floor. Alas, nowhere is perfect. What would a street packed with foreign restaurants be without the token Italian eatery? Well, Laowai Jie doesn’t disappoint, because there are a few options, but Porta Nova is the best of the bunch. Porta has 29 different types of pizza, along with other Italian dishes, all made with fresh, imported ingredients. The extensive wine list ain’t bad either, and there’s also a salad bar. Tip: sit outside on the terrace for a true al fresco dining experience. A buen Spanish restaurant specializing in, you guessed it, tapas! There are four other locations around town, but since we’re focusing on Laowai Jie, apart from tapas such as tortilla espanola, olives, cheeses, breads, chorizo, calamari, and the other usual suspects, they also have good paella and pastas. I’d recommend sticking with the tapas, however. The wine selection is fairly nice as well. Try their lunch special: for 88 RMB you get a salad and dessert buffet, along with one drink and two tapas. The best way to get there is by taxi; from Jing’an District will cost about 40 RMB. To budget, take the metro to Shuicheng Lu station and walk west out of Exit 3 for a few minutes. Then turn south on Zhonghuan Lu and keep going until you pass Yan’an Lu. After Yan’an, continue straight on Zhonghuan for about 100 m and you’ll spot Laowai Jie on your right hand side. Expat Finances: China’s Depreciating Yuan and its Effect on You! Nice, I used to live on Hongmei road, literally right next to this place! Good memories! I'm waiting for the China towns to be renamed Chinky towns to reflect their culture. But that would be totally racist (already, streets with the name "Chinaman" are being renamed in the US, since they're offensive), but Westerners in China are just supposed to take it and accept the excuse that "You are just too stupid to understand Chinese culture. It's not really racist, and it's your fault for getting offended when we refer to you with racial slurs." I like how the author assumes everyone knows which city Gubei District is in. Cuz apparently there's no expat world outside Shanghai.